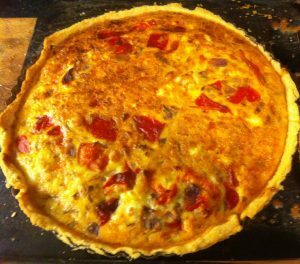 You will need three medium or two large red peppers; a red onion, garlic, fresh oregano or thyme, 150g feta cheese and six eggs; plus pastry ingredients: 200g flour, 100g butter. Try to track down Spanish or Italian peppers, which will have ripened in the sun, rather than UK or Dutch, which will have been grown under glass. You will also need a 24cm metal flan tin, loose-based. Pastry: Your usual shortcrust pastry (just make it in the same way as you normally do – 200g plain flour and 100g butter); 175g plain flour; 125g butter – whizzed in food processor; add 3 tbs water; form into a ball. Chill in fridge for 30mins or so – even overnight. Roll out the pastry fairly thinly. Line a fluted metal flan tin with pastry – this is enough for one 24cm tin plus two little 11.5cm tins. Bake blind at 190°C for 15 mins. They will probably shrink, so line on outside with foil before filling to catch the worst of spills. Fry onion gently in oil till soft – say 5 mins. Add garlic and oregano/thyme – another two mins or so. Add chunked peppers, take off heat. In a mixing bowl, beat 6 eggs; crumble in the feta; add veggies. Mix well; season cautiously – unlikely to need salt. Pour into tins and bake at 190°C until puffy and golden.